New service makes mobile-friendly web sites obtainable by small businesses. Last week at HostingCon I caught up with Patti Kelly, director of product management at Verisign, to discuss the launch of a new product that makes it easy for small businesses to create a mobile friendly version of their web site. VeriSign MobileView uses mobile detection and redirection to render mobile friendly web sites while keeping the same domain name that customers already use. The key is simplicity. 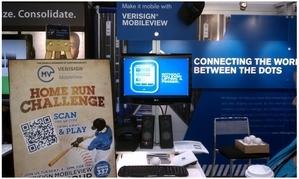 MobileView was created for small businesses who have small marketing budgets and little technical expertise. It’s offered through VeriSign’s partners, so a registrar can offer it to its existing client base. MobileView automatically creates a mobile friendly display of an existing web site, but users can edit it through an online console. (Users can also create a separate, mobile-only web site from scratch). If the customers’ web host supports MobileView then they won’t have to edit their existing site’s HTML. This is one key difference between VeriSign’s offering and dotMobi’s GoMobi. GoMobi users either need to use a separate URL or edit their web site’s HTML to enter a mobile browser detection script. To gain adoption, VeriSign is offering the service free to its partners on VeriSign managed domains (e.g. .com and .net) through December 2012. Partners can mark the cost up as they please.